This is the eighth post in my series Drought in California. In Part 1: California Climate and Drought, I found that drought is projected to be the “new normal” climate in California. In Part 2: The Status of California’s Current Water Resources, I found that California is already depleting both it’s groundwater and surface water resources. In Part 3: California’s Total Water Deficit, I constructed an overall estimate of California’s future water deficit, concluding that it will be about 25.1 million acre-feet per year, about 39% of California’s current dedicated water supply. In Part 4: The Potential to Procure Additional Ground and Surface Water, I found that a variety of obstacles and problems made it unlikely that California could cover the predicted future water deficit by tapping additional groundwater or surface water resources. In Part 5: The Potential of Desalination, I found that using desalination to cover the projected water deficit was within the realm of conceptual possibility, but it would be costly and would involve a massive infrastructure program. In Post 6: Conserving Water – Population and Environment, I concluded that conserving water by voluntarily limiting population growth or by stealing it from the environment would be objectionable due to severe negative effects. In Post 7: Conserving Water – Agricultural Water Efficiency, I concluded that some water conservation could be achieved in the agricultural sector, but only a fraction of the amount needed. The result would be the failure of many farms, causing unemployment and economic stress in California’s farming communities. 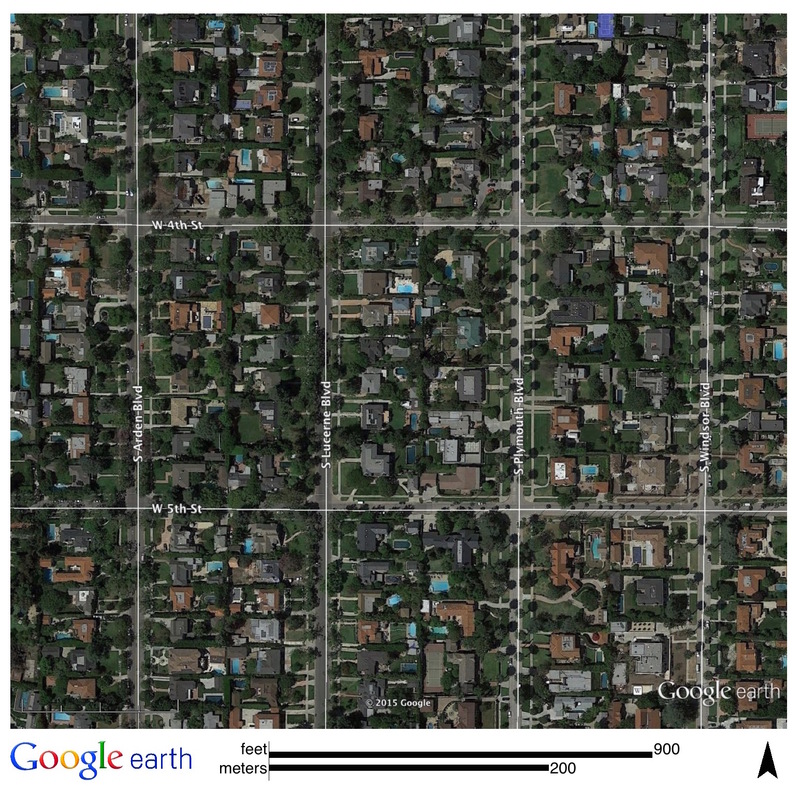 In this post I explore the potential for Urban Water Conservation. Figure 22b. 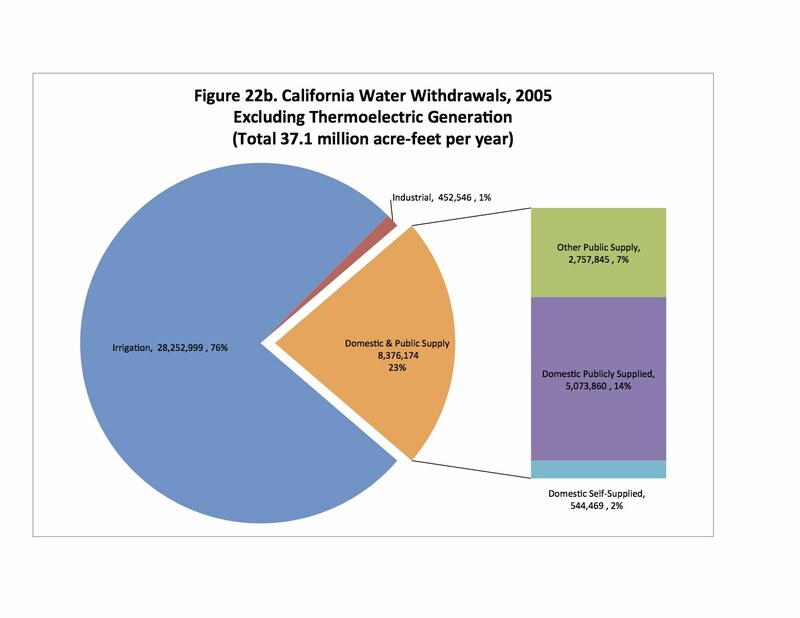 California Water WIthdrawals in 2005, Excluding Withdrawals for Thermoelectric Generation. Data source: USGS, 2005. In Part 3 of this series, I calculated that California future water deficit would be 25.1 million acre-feet. Thus, the future water deficit will be more than 2.8 times as large as California’s current urban water consumption. Even if California were to deliver no water at all to its urban areas, it would leave 65% of the water deficit unaddressed. Thus, while it is useful and important to pursue, urban water conservation can only be a small part of any final solution. One would similarly think that there would be many studies of urban water conservation in California, but there aren’t. The only study I could find that attempted a statewide assessment of the potential for urban water conservation was Waste Not, Want Not, published by the Pacific Institute (Gleick et al 2003). The Waste Not Study estimated total urban water consumption to be 7.0 million acre-feet, some 20% less than the estimate by the California Department of Water Resources. The Waste Not Study estimate appears to be an outlier, so in what follows I will use the fractions and percentages from the Waste Not Study, and adjust the amounts to reflect the 8.8 million acre-feet total from the California Department of Water Resources. 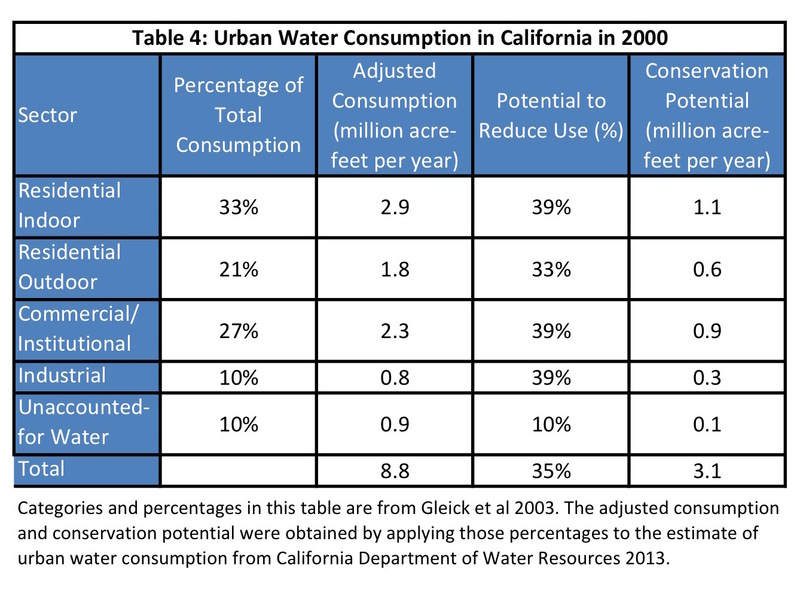 Table 4: Urban Water Conservation in 2009. Source: California Department of Water Resources, 2009. Residential use accounts for the largest fraction of urban water consumption, with residential indoor uses accounting for 33% of all urban consumption, and residential outdoor uses accounting for 21%. (See Table 4 at right.) Commercial consumption was next, accounting for about 27% of consumption. Industrial consumption and Unaccounted-for Water (leaks in the utility water delivery system) accounted for about 10% of consumption each. In both the Residential Indoor and the Commercial Sector, flush toilets accounted for the largest fraction of water consumption. In the Residential Outdoor sector, the largest consumer was water for landscaping (watering). The Waste Not Study considered only conservation strategies that avoided a reduction in service to the end-user. For instance, using a low-flow showerhead was considered, taking fewer showers was not. Similarly, improving landscape watering systems was considered, modifying the landscape design (plant choices or layout) was not. Similarly, only cost-effective conservation strategies were considered, meaning strategies that cost less to save a given amount of water than would strategies to add that much additional water supply. The Waste Not Study concluded that California could achieve about a 35% reduction in urban water consumption, or 3.1 million acre-feet per year. (See Table 4.) That is about 12% of the projected water deficit of 25.1 million acre-feet per year. The Waste Not Study includes water reused by an end-user (capturing used water and using it again, either for the same purpose or for a different one), but it does not include replacing freshwater with recycled water. Recycled water, also called reclaimed water, is an umbrella term indicating various methods of capturing, treating, storing, and reusing wastewater, often at the scale of a public water system. Depending on what pollutants are in the wastewater and the degree of treatment, recycled water can be suitable for many uses, including use as potable drinking water. You have to get over the psychological “ick factor,” but recycled water can be very high quality drinking water. 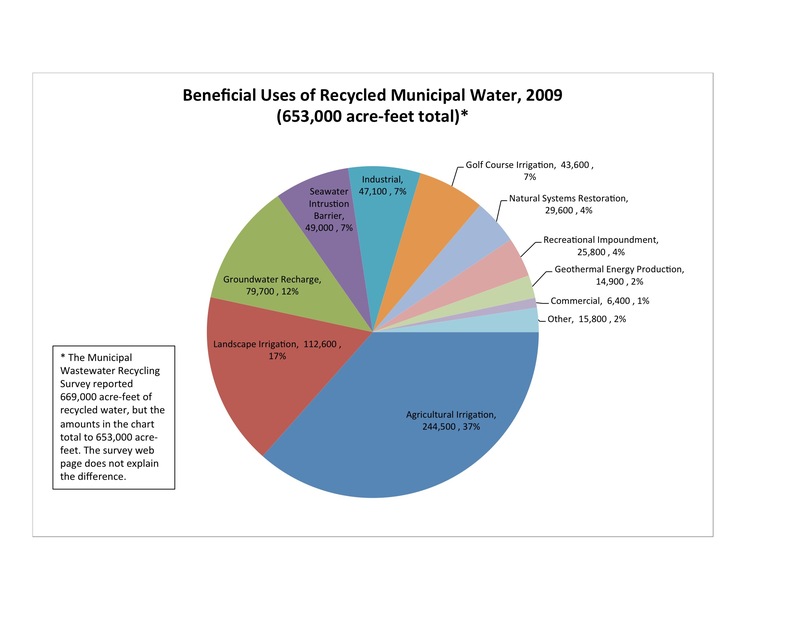 Figure 29: Recycled Water in California, 2009. Sources: Gleick et al. 2003; State Water Resources Control Board 2015. As of 2009, the most recent data, California recycled about 669,000 acre-feet of water per year. Figure 29 at right shows how it was used. Among the uses, groundwater recharge might reduce urban water consumption if the aquifer being recharged is used as a water source for an urban water system. A number of the other uses do not: agricultural irrigation, seawater intrusion barrier, natural systems restoration, and geothermal energy production. Eliminating these uses from the total means that recycling water reduces urban consumption of new water by 315,000 acre-feet per year, which is about 4% of urban water consumption. California may have the potential to roughly triple its use of recycled water, to 2.2 million acre-feet per year (Olivieri et al. 2014). If it was apportioned among users as recycled water is currently apportioned, then it would reduce urban consumption by about 1.1 million acre-feet. Figure 30: California Water Conservation 6/2014-6/2015. Source: State Water Resources Control Board 2015. In both May and June of 2015, California met the goal statewide, and in every hydrologic region except the North Coast. Figure 30 at right shows the data. The program is too new to know at what level conservation will stabilize, but if conservation were to stabilize at the 27.3% level of June, it would represent a 2.4 million acre-feet per year reduction. That would represent slightly less than 10% of my projected future water deficit (State Water Resources Control Board 2015). What does urban water conservation mean to the water user? Water conservation can include either behavioral or technological strategies. There are dozens, if not hundreds, of different strategies, ranging all the way from installing a low-flow showerhead, to installing grey water systems to capture used water and reuse it, to installing ground moisture sensors to control a sprinkler system, to very sophisticated analyses of industrial processes to minimize water consumption. If, as the Waste Not Study suggests, millions of acre-feet per year can be saved at costs lower than getting additional water, then you would think that people would have flocked to adopt these conservation strategies. But they have not, the state has had to provide incentives for decades to achieve even partial adoption. Why? I suspect that the answer lies in studies that McKinsey & Company did on reducing greenhouse gas emissions. They discovered that no single strategy could be applied throughout the economy to significantly reduce greenhouse gas emissions. Rather, like water conservation, there were dozens, if not hundreds, of smaller strategies, many of which had to be separately adopted by thousands, if not millions, of individuals. Though many of the strategies were cost-effective in the long run, they required up-front outlays of capital. They required significant investments of time and required the acquisition of special knowledge and expertise. Each saved only a small portion of the needed overall savings, requiring the adoption of many strategies. Sometimes there were market inefficiencies that prevented their adoption, including outdated regulatory requirements and split incentives (the person paying for the strategy was not the person who reaped the financial reward). (Creyts et al, 2007, Granade et al, 2009) Given these facts, it was not surprising that strategies to reduce greenhouse gas emissions had not been more widely adopted. I know of no similar analysis regarding water conservation. But one doesn’t have to be a rocket scientist to look at the list of strategies from the Waste Not Report and see that a similar analysis might apply to them: there are many strategies that would have to be implemented, each requires an initial outlay of capital, and many of them require the acquisition of specialized knowledge or expertise. In some cases, market inefficiencies hinder adoption, and outdated regulations may prohibit them outright. Figure 31: Central Los Angeles Seen from Space. Source: Google Earth. In addition, I would challenge the assertion that these strategies do not involve a reduction in service to the end-user. Low-flow showerheads, for instance, have significantly improved over the years. However, that does not mean that taking a shower with a low-flow showerhead is equivalent to the luxurious experience of showering with a quality high-flow showerhead. It can be done, and in California it seems that it must be done, but please don’t try to tell me it is the same, it isn’t. The same would be true for a gray water system: it introduces a level of complexity and complication that does not exist when using potable water for all purposes. In addition, The Waste Not Study did not consider conservation strategies that require behavioral change, such as showering less often, reduced washing of the car. or turning the beautiful landscaping of Southern California into a xeriscape. At right are two Google Earth renderings, Figure 31 shows traditionally landscaped central Los Angeles, and Figure 32 shows xeriscaped Paradise Valley, the wealthiest suburb of Phoenix (Wikipedia, Paradise Valley, Arizona). Even from space, the difference is plain to see. 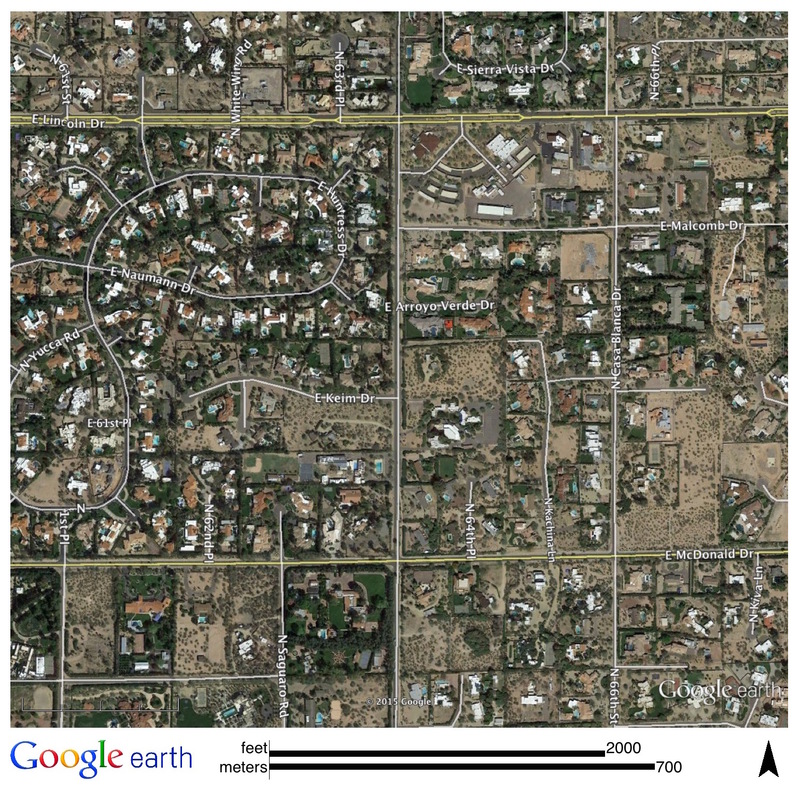 Figure 32: Paradise Valley, Arizona Seen from Space. Source: Google Earth. The term “reduction in service” does not quite capture the changes that water conservation in California would require. To me, it seems to require a substantial change in the lifestyle for which California has been famous for decades. It seem to require a costlier, more complicated, somewhat dirtier, significantly less beautiful lifestyle. Not at all what California is famous for! In considering what the drought and what climate change mean for California, this change will be very important, I believe, and over the years will make California a less attractive place to live. In summary, California’s urban areas consume about 8.8 million acre-feet of water per year. Because this amounts to significantly less than half of the projected future water deficit of 25.1 million acre-feet, urban water conservation can only be a small fraction of any final solution. Only one study exists of the state’s urban water conservation potential. It concludes that California can reduce its urban water consumption by about 35%. Compared to 8.8 million acre-feet of total consumption, that would be 3.1 million acre-feet. Another 1.1 million acre-feet can be conserved by recycling water at the public water utility level. The combined 4.1 million acre-feet represents about 16% of the projected future water deficit. Far from being easy or cost-free, however, urban water conservation would seem to involve significant capital outlay and a significant degradation in the lifestyle for which California is famous. Becerra, Hector. “California Officials Admit They Have Incomplete Water Usage Data.” Los Angeles Times. July 26, 2014. Accessed online 8/8/2015 at http://www.latimes.com/local/la-me-water-use-war-20140727-story.html. California Department of Water Resources. 2009. Quoted in California Department of Water Resources. 2013. California’s Water Plan: Volume 3, Resource Management Strategies. Chapter 3: Urban Water Use Efficiency. Retrieved online 8/9/2015 at http://www.waterplan.water.ca.gov/docs/cwpu2013/Final/Vol3_Ch03_UrbanWUE.pdf. Creyts, Joh, Anton Derkach, Scott Nyquist, Ken Ostrowski, and Jack Stephenson. 2007. Reducing U.S. Greenhouse Gas Emissions: How Much at What Cost? New York: McKinsey & Company. Executive Order B-29-15. 4/1/2015. Retrieved online 8/11/15 at http://gov.ca.gov/docs/4.1.15_Executive_Order.pdf. Gleick, Peter, Dana Haasz, Christine Henges-Jeck, Veena Srinivasan, Gary Wolff, Katherine Cushing, and Amardip Mann. 2003. Waste Not, Want Not: The Potential for Urban Water Conservation in California. Berkeley, CA: Pacific Institute. Granade, Hanna, Joh Creyts, Anton Derkach, Philip Farese, Scott Nyquist, and Ken Ostrowski. 2009. Unlocking Energy Efficiency in the U.S. Economy. New York: McKinsey % Company. Office of Administrative Law. 2015. Notice of Approval of Emergency Regulatory Action. Retrieved online 8/11/2015 at http://www.waterboards.ca.gov/waterrights/water_issues/programs/drought/docs/emergency_regulations/oal_approved_regs2015.pdf. Olivieri, Adam, Edmund Seto, Robert Cooper, Michael Cahn, John Colford, James Crook, Jean-Francois Debroux, Robert Mandrell, Trevor Suslow, George Tchobanoglous, Robert Hultquist, David Spath, and Jeffrey Mosher. 2014. “Risk-Based Review of California’s Water-Recycling Criteria for Agricultural Irrigation. Journal of Environmental Engineering. 2014.140. American Society of Civil Engineers. Accessed online at http://ucanr.edu/datastoreFiles/234-2791.pdf. State Water Resources Control Board. 2015. June 2015 Statewide Conservation Data. Retrieved online at http://www.waterboards.ca.gov/waterrights/water_issues/programs/drought/docs/fs073015_june_by_the_numbers.pdf. USGS. Estimated Use of Water in the United States. County Level Data for 2005. http://water.usgs.gov/watuse/data/2005. Wikipedia. 2015. Paradise Valley, Arizona. Accessed online 8/5/2015 at https://en.wikipedia.org/wiki/Paradise_Valley,_Arizona. By mogreenstats in Climate Change, Consumption and Supply, Other Climate Change, Water on 2015/08/13 .